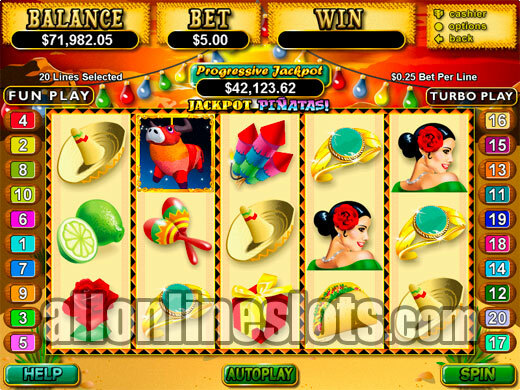 Jackpot Pinatas is one of the biggest progressive slots by RTG. It has a base jackpot of $250,000 and a max bet of $5. Win the jackpot with five bull symbols on any line. The game also has a free spin feature where extra bulls are added to the reels. 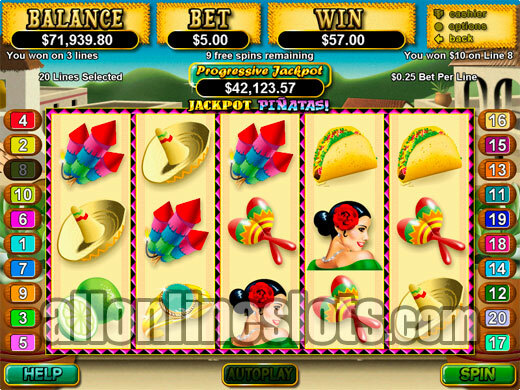 Jackpot Piñatas is a progressive slot machine found at Realtime Gaming online casinos. It has a base level jackpot of $250,000 and has gone over $1,500,000. It has a fixed coin size of 25 cents and a max bet of $5. As usual you have to play max bet to have a chance at winning the progressive prize. The game has a Mexican party theme with three types of piñatas (Dog, Bull and Donkey) as well as symbols such as Tacos, Hats, Fireworks and Girls. The three piñata symbols are the ones to look for as they are all they keys to the biggest prizes. First up the Donkey Piñatas are wild and substitute for everything but the scattered dogs and the bull jackpot symbols. Five wilds pays a big 20,000 coins or $5,000. Second highest line win is 3,000 coins for five girls and third highest pay is 2,500 coins for four Bulls. The Bull Pinatas are the key to the progressive jackpot. Get five on any active line and you win the jackpot. It is worth noting that you cannot have any wilds as part of the win as the wilds do not substitute for the bulls. 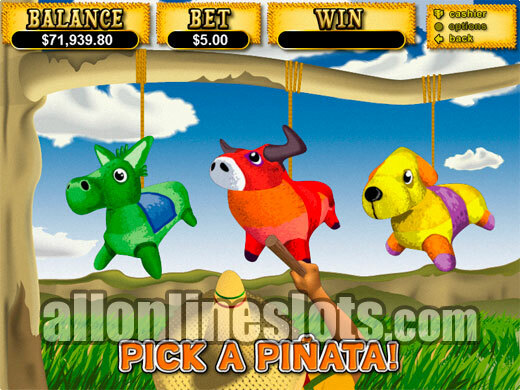 The Dog Pinatas are scattered and pay up to 1,000 times your bet if you get all five on the screen at once. Get three or more and you activate the bonus stage. Here you are presented with three pinatas and get to pick two out of the three. On each pick you can win up to 200X your bet (Screenshot). If you reveal a rose on one of your picks you get another shot at the bonus. You can keep getting extra rounds as long as you reveal a rose on each stage. If you fail to find a rose the bonus stage ends and you are awarded a random amount of free spins (5, 10, 15, 20 or 25 games). During the free games all wins except the bull pinata combinations and the progressive are doubled. This boosts the five wild symbol line win to 40,000 coins or $10,000. Extra bulls and dogs are added to the reels so it is slightly easier to win the jackpot or trigger the bonus on the free spins. It's always great to see new progressive slot being released and RTG was in need of some new jackpot games. Jackpot Pinatas add an excellent game to the Realtime Gaming progressive line up and is well worth a look.